David Sainsbury (also Lord Sainsbury of Turville) read History and Psychology at King’s College, Cambridge, and then joined J Sainsbury plc in 1963. He received an M.B.A. from the Columbia Graduate School of Business in New York in 1971. He was Finance Director of J. Sainsbury plc from 1973 – 1990, Deputy Chairman from 1988 – 1992, and Chairman from 1992 – 1998. 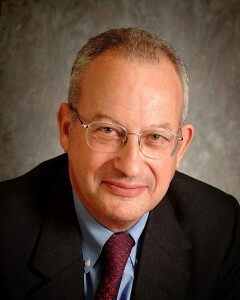 David Sainsbury became Lord Sainsbury of Turville in October, 1997. He was appointed Minister of Science and Innovation from July 1998 until November 2006, and had responsibility for the Office of Science and Technology, Innovation, Space, the Bioscience and Chemical Industries, and the Patent Office. He is the founder of the Gatsby Charitable Foundation, and in 2003 received, on behalf of the Sainsbury family, the Andrew Carnegie Medal for Philanthropy.